The Sea-Doo Life Test Ride Tour offers consumers the chance to experience the boating lifestyle and latest technologically advanced Sea-Doo watercraft and boats for free. BRP will be visiting 28 popular family boating meccas across the United States this spring and the Atlanta is the next stop. The Sea-Doo Life Test Ride Tour offers consumers the chance to experience the boating lifestyle and latest technologically advanced Sea-Doo watercraft and boats for free. Consumers can also register in the Share the Sea-Doo Life to enter to win a Sea-Doo GTX† S 155™ watercraft and MOVE iCatch trailer. The Sea-Doo LIFE Test Ride Tour visits popular boating venues across the US to promote the boating “life.” These festive events are intended to provide both current and potential boaters a structured opportunity to experience the new Sea-Doo watercraft and boat designs and iControl technology first hand. Attendees are offered an on-water experience aboard a variety of Sea-Doo PWC, the only watercraft with a brake and Sea-Doo 210 platform boats. The Sea-Doo Life events are FREE to the boating public and managed by the Sea-Doo events team - comprised of industry and product experts - and partnering, authorized Sea-Doo watercraft and boat dealers. Each Sea-Doo iControl Tour STOP is designed for both experienced and first time boating families to experience the Sea-Doo LIFE in a casual, fun filled atmosphere with fun to be had on land as well as on-water. Event participants will be able to experience multiple models to best find the right Sea-Doo product to fill their watersport/boating life. 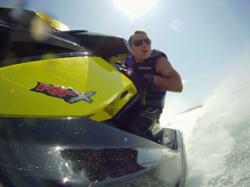 When: The Sea-Doo LIFE Test Ride Tour will be in Atlanta, May 18-20, 2012.